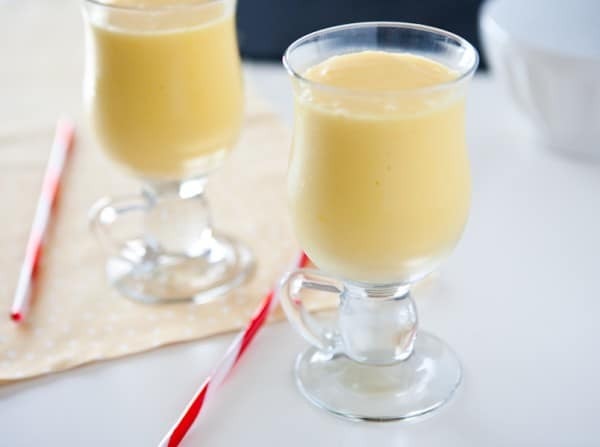 Pina Coladas are one of my favroite girly drinks. Sweet, creamy coconut milk mixed with sweet friut is so good, but you don’t have to use pineapple juice. 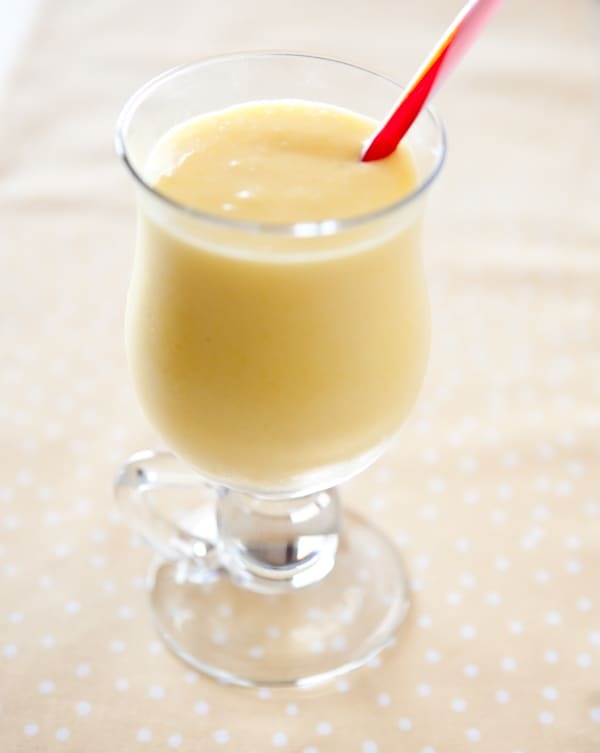 For this Colada, I used fresh mangos and mango juice to make a mango colada. It’s just as good, if not better. Mangos are a fruit I buy pretty often in my house. They are super sweet, soft and best of all my son loves to eat them. Some other fruits may go bad in our house, but never a mango. Fortunately, some variety of mangos are available year round, so we never have to wait for them to come in season. They are packed with vitamins and nutrients too. And did you know that the mango was the single most popular fruit in most other countries except the U.S.? Add all ingredients to a blender. Blend on high until smooth. For more information on mangos and some great recipes, visit the Mango Board website here, is www.mango.org. To enter to win: A Mango cookbook (one of the readers of this blog will win) and $200 to Williams-Sonoma with a shipment of mangos (only one prize will be awarded at random to all blogs participating in this campaign). Tell me in the comments section below: What are your family’s favorite ways to enjoy fruits and veggies? This post sponsored by the National Mango Board, all opinions 100% mine. The National Mango Board challenged me to spend a week creating healthier eating and snacking habits for my family. Join the conversation and one of my readers will receive a cookbook and a chance to win a shipment of mangos and $200 gift card to Williams-Sonoma. This is a sponsored conversation written by me on behalf of National Mango Board. The opinions and text are all mine. Official Sweepstakes Rules. I could use one (or three) of these right now. I love mango! We love grilled veggies and fruits in the summer and early fall. This recipe sounds great and I plan to try it with friends this weekend. We love smoothies made with fresh watermelon and frozen strawberries in the summertime. Tastes great with a splash of rum as well…strawberry-watermelon daquiries. Neat! I have smoothies most days for lunch — a way to get my servings in a drink. Go, camera guy!! Future videographer? Love mangoes – it is interesting that it’s not as popular here, but it’s not exactly local…best I’ve had are the Alphonso mangoes. Love this version! Sounds delicious .. Even though fall is here!?!? It still feels like summer here in California 101 today so mango coladas it is.. Thanks for the give away. I love fresh corn in the summer. Broccoli salad is another favorite. Can’t beat a big bowl of fresh fruit. Thanks so much for this wonderful website as well as this post. This post is the kind of thing That keeps me on track through. http://literatureessayservice.org/customsessay-com-surprise-me-if-you-can/ I’ve been looking around for this site after I heard about them from a buddy and was thrilled. Thanks a bunch. You have provide nice information on mangos and some great recipes. Thank you so much for this wonderful website. It was a quite nicely presented topic and I just love the way you present this topic. You have used a unique style of writing over here. You can use UK dissertation writing service for getting more new tips. This imbibe is not adieu to send your iodine level attractive off, but rather it can add to a universal thoughtful to build them. The banana has a stroke of iodine in it, additionally furnish Research Paper Writing Help you by fiber to lend a hand with any impasse interrelated with an underactive thyroid, and potassium to keep your raw equipment ended off. I read your post, this is very effectivepost about mango-colada.